Even the Wingless is a science-fiction novel in the same 25th-century interstellar United Alliance setting as the author’s anthropomorphic Pelted stories, such as Alysha’s Fall (Cornwuff Press, September 2000; review). This novel features anthropomorphic “dragons”. The multi-planet Alliance consists of numerous races/species; humans, the various bioengineered Pelted animal-peoples, and the human-looking but telepathic, pallid Eldritch among them. Outside the Alliance are other interstellar nations, including the Chatcaavan Empire of shape-shifting, mammalian humanoid aliens. 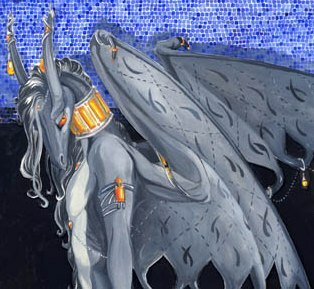 Even the Wingless is set in the dragons’ empire, and its protagonist is an Eldritch. CreateSpace, January 2012, trade paperback $15.99 (385 pages), Kindle/ePub/HTML/PDF $5.99. Lisinthir Nase Galare is an Eldrich esper substituting for a human, the latest Ambassador to be sent by the Earth-headquartered but Pelted-world-dominated Alliance to the Chatcaavan Empire. ‘And still they send unsuitable candidates,’ Lisinthir said, accepting the coffee and with it the flutter of emotion the human passed him through their brief contact. ‘It’s good to begin with talk,’ Lisinthir said. You can guess the only reason the Emperor or his male subordinates ever visit the harem. Descriptions of the humanoid mammalian dragons are dropped sparingly into the story. They have horns, wings, beaks and pointed ears, they are dark-gray skinned with soft scales and manes, four-armed, with thin tails, a little over five feet tall with “vast, white-less” scarlet eyes. Nine of the twelve prior Alliance ambassadors have been Pelted; one Tam-illee, four Seersa, a Phoenix, an Asanii, and two Aera. All have been too delicate, too civilized to fit into the Chatcaavan Emperor’s sadistic court. But he is only slightly worse than the general Chatcaavan society. 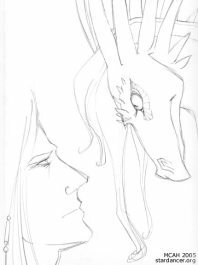 The dragons are all cruel and callous, encouraging the strong to trample the weak, and treating females as worthless except as breeders and objects to satisfy sexual lusts. So: to ignore the imperial court’s decadences is to become ignored oneself, or worse, nullifying the Alliance’s influence; while to participate in them is to become a disgusting hedonist, misrepresenting the Alliance and ignoring its interests. Lisinthir’s mission is spelled out by the Eldritch Queen. Lisinthir begins his ambassadorial service by adopting the attitude known as “insult them until they apologize”, a dangerous game since taking a more conciliatory attitude will get him (and the Alliance) despised, while to truly insult the Emperor or his courtiers can get him sent home in disgrace or (more likely) killed. 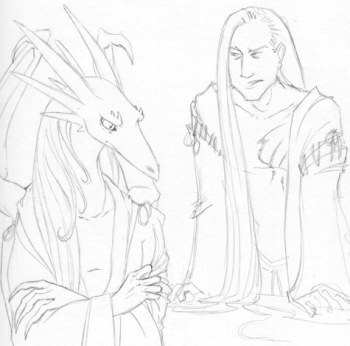 Lisinthir’s arrogance amuses the Chatcaavan Emperor, who “befriends” the Ambassador whom he can so easily have killed. The two engage in an amiable social relationship in which the dragon constantly tries to subtly insult or humiliate the Eldritch, who skilfully ripostes the traps. The dialogue of the two becomes a sophisticated verbal duel which can be deadly if Lisinthir makes the slightest mistake; especially since the Ambassador is determined to rescue the latest Alliance slaves whom the Chatcaavans have captured. Meanwhile, the Slave Queen broods on the plight of females in the Empire. Lisinthir senses a potential ally – especially since Khaska, real name: Laniis, was an Alliance Fleet Intelligence agent before her capture – who can help him to rescue the slaves. But Lisinthir’s ultimate goal is not to rescue one batch of slaves, but to persuade the Chatcaavans (which means to persuade the Emperor) to renounce the practice of enslaving Alliance citizens. And the only way to accomplish this is to remain in the Chatcaavan court after helping the Pelted prisoners to escape, and openly challenge the Emperor. 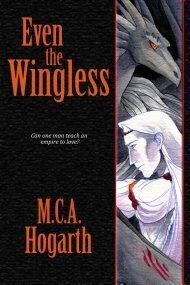 Even the Wingless is skillfully told, and is a satisfying s-f adventure. Yet I found myself wondering all through it why the Alliance did not take a more martial stance against the Empire from the beginning? It worked for the new U.S. confronting the Berber States at the beginning of the 19th century. Presumably the parallels are not the same. The U.S. could afford belligerence and to attack the arrogant but weak Beys of Algiers, Tunis, and Tripoli, while the Alliance seems to be under the control of Pelted pacifist politicians. Also, the story never clarifies the relative strengths of the Alliance and the Empire; possibly the Alliance is not in a position to challenge the Empire militarily. Finally, given the natures of the Alliance government and the Eldritch, Lisinthir’s victory is more satisfying accomplished by intellectual means and a formal duel; by coming on like Scaramouche rather than Rambo. But it is said that to truly understand an enemy, it is necessary to become him. As Lisinthir, the Emperor, and the Slave Queen slowly maneuver around each other, they grow familiar with each other’s natures. Too familiar …? I stayed up for hours reading through the preview last night. The characters are distinctive, although they're enhanced further by the artwork on the author's website. I've yet to find one I empathize with, though . . . at least, not one that lasted long. The Chatcaavan Empire is a harsh world filled with harsh people. I understand this novel was once accepted by Tor, but left in limbo by the departure of an editor. It's their loss. Other than a couple of words that seemed like they had been placed there for their own sake when a simpler one would do, and the fact that the aforementioned art doesn't appear to accompany the story, it's hard to fault.